I’ve had a few dishes over the course of doing this blog that feel like acquired tastes that I haven’t yet acquired. That was definitely the case with fufu, a very popular West African dish consisting of mashed cassava and plantain. It’s… interesting. It tastes a lot like a much starchier, gummier version of mashed potatoes. It doesn’t have much flavour, but then I don’t think it’s meant to be eaten alone. It’s traditionally served with soup (in the photos I’ve seen online, they’re served separately, but here it’s all in one bowl). I got the peanut soup (something called “light soup” was also an option), which was rich, flavourful, and pleasantly spicy. It’s an absolutely enormous portion, and I found myself getting sick of eating it long before it was done. I actually quite liked the vibrant soup — the slightly elastic, gummy fufu, on the other hand, I wasn’t as sold on. It comes with a few chunks of beef and fish, which weren’t great. The beef was so incredibly tough that I could barely pierce it with a fork, and the fish was dry despite being submerged in soup. 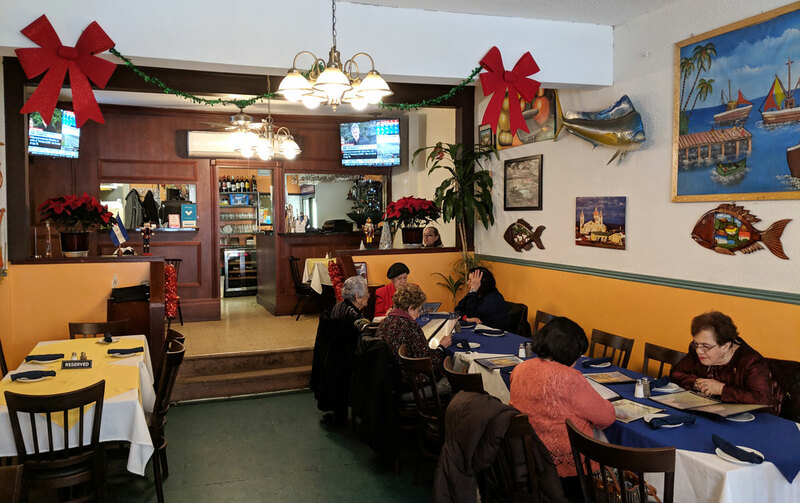 It’s always a good sign when you go to a restaurant and hear almost no English from the proprietor or the surrounding tables. 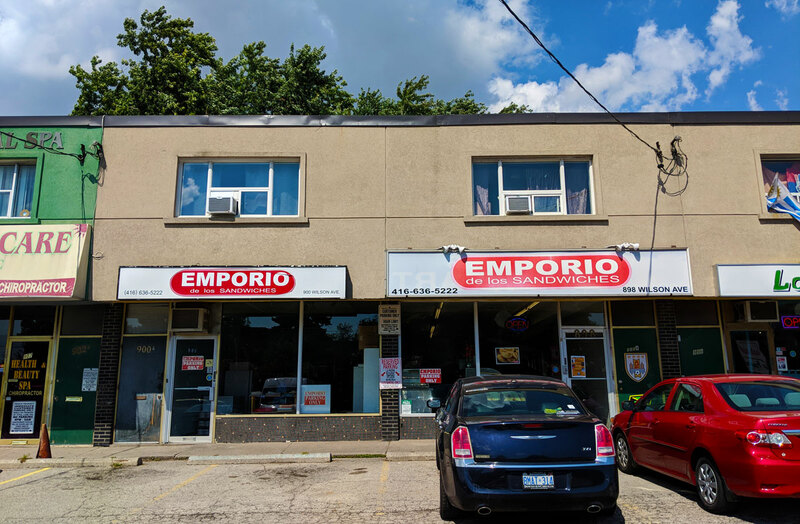 There are so many reasons why living in a city as multicultural as Toronto is a great thing, but food is certainly at the top of that list. I honestly don’t think there are too many other cities in the world where I could do a blog like this. So I was fairly confident that I was in good hands at La Bella Managua. Eating the food confirmed it. I tried a couple of things. First up was the Pollo a la Parrilla. 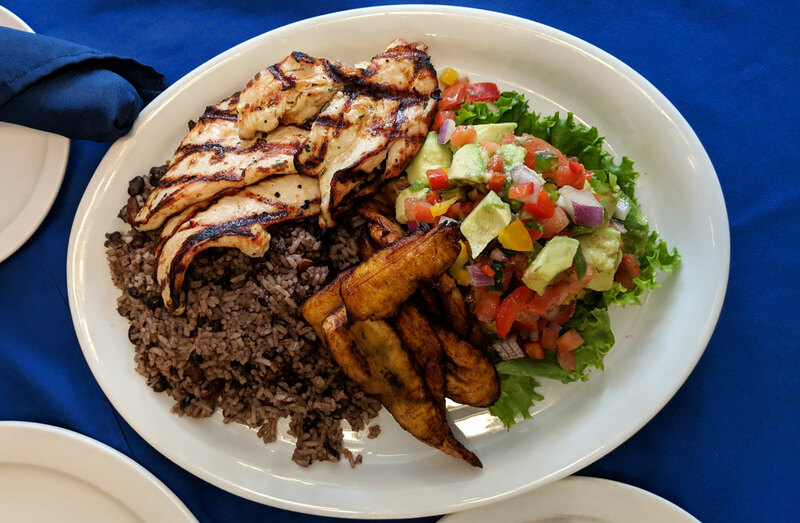 This featured a perfectly grilled piece of chicken, rice and beans (gallo pinto, which is Nicaragua’s national dish), salad, and fried plantains. Everything was great. The chicken was nicely grilled and seasoned, with some welcome crispiness on its exterior and a perfectly cooked interior. White meat is very easy to overcook, turning it dry and unappealing, so kudos to them for preparing this so well. And the sweetness of the fried plantains balanced nicely with the savoury chicken. The gallo pinto was simple enough, but very satisfying, as was the salad (which consisted mostly of avocado, tomato, peppers, and red onion). I’m normally not a big fan of raw onions in salad, but these were mild enough to be acceptable. This might be the least photogenic thing I’ve ever eaten. I mean, it looks horrifying. But it’s the ultimate “don’t judge a book by its cover” dish, because it was absolutely delicious. Unlike the tamales I recently had at Tacos El Asador, these were absolutely crammed with flavour, and the tender pork loin gave it a satisfying meatiness. In case it wasn’t obvious enough from the chicken, this is a top-shelf restaurant doing top-shelf stuff. One thing I’ve noticed while doing this blog is the culinary overlap in various parts of the world. Similarities like steak and egg dishes in Latin America, spicy rice in Africa, or more obvious ones, like noodles in Asia. It’s hard not to notice overlap once you start focusing on the breadth of world cuisine. 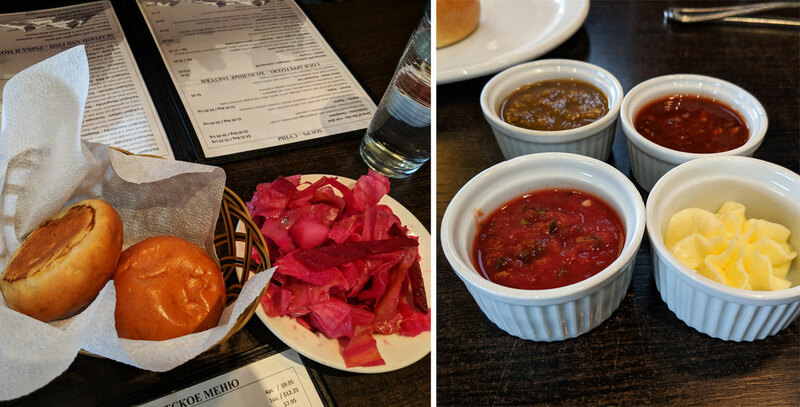 The latest (and oddest) connection I’ve noticed is serving bread with a spicy, salsa-like condiment in Eastern European countries — I first encountered this at Moldova Restaurant, and now at Suliko. 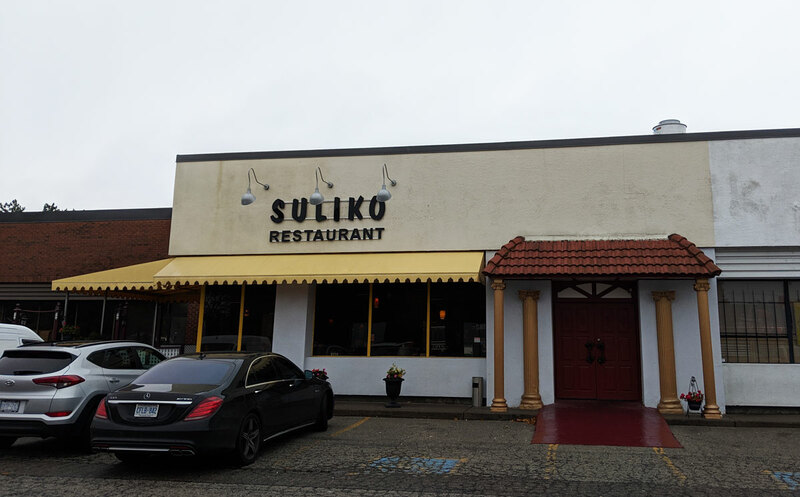 In fact, Suliko goes one step further, serving their bread basket with three different salsas of varying spice levels. It’s a tasty — if somewhat odd — combination. I tried a couple of other things on the menu. First up: hachapuri imeretinsky, which is one of Georgia’s two national dishes (according to Wikipedia, at least). It basically looks like a pizza, though it doesn’t particularly taste like that dish, with a softer and breadier texture, and a filling that consists solely of cheese. It was quite tasty, particularly when it was hot and fresh, with a nice contrast between the soft bread and the gooey, salty cheese. The next thing we tried was khinkali, Georgia’s take on the dumpling, and their other national dish. We tried a couple of varieties: pork and beef, and lamb. They were both really satisfying, with a soupy, meaty interior that features a very distinctive spicing that set it way apart from a typical Chinese dumpling. The wrapper was also thicker than you’d expect, which actually worked quite well with the strongly-flavoured meat. 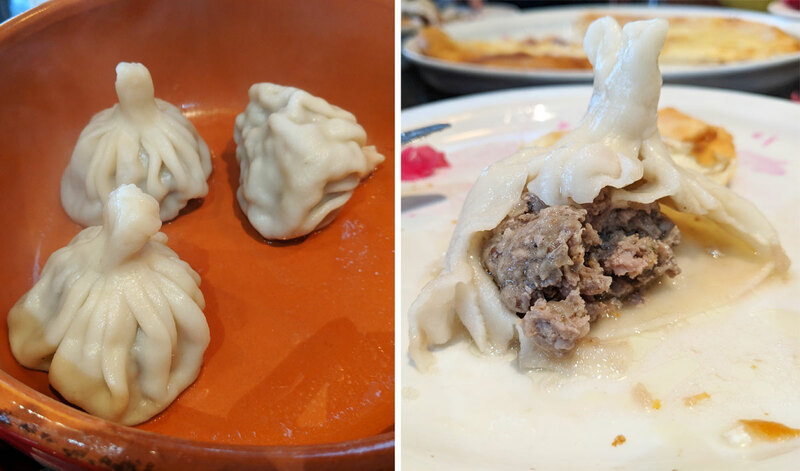 It probably wasn’t necessary to get two different types of meat dumplings, however — though the lamb dumplings had a mildly lamby flavour, both types basically tasted the same. 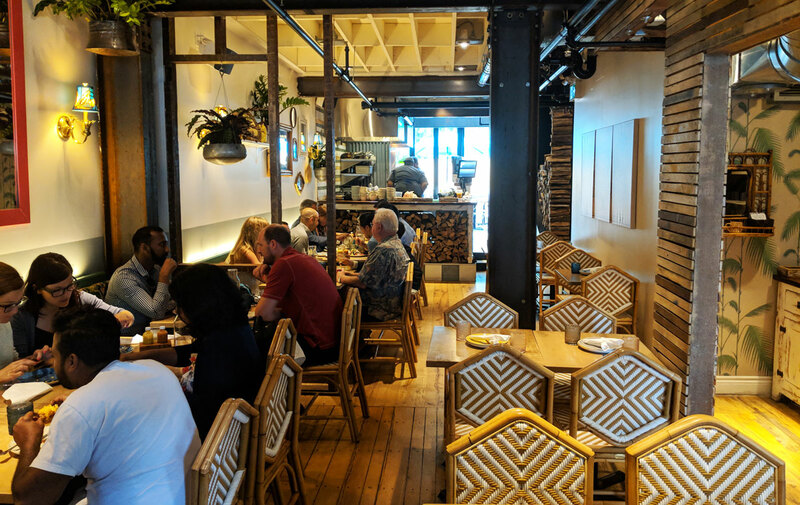 I’ve eaten a lot of seriously tasty stuff since starting this blog, but the meal I just had at Michael’s West Indian Flavor might just be the tastiest. Certainly, it would be in the top five. It was amazing. 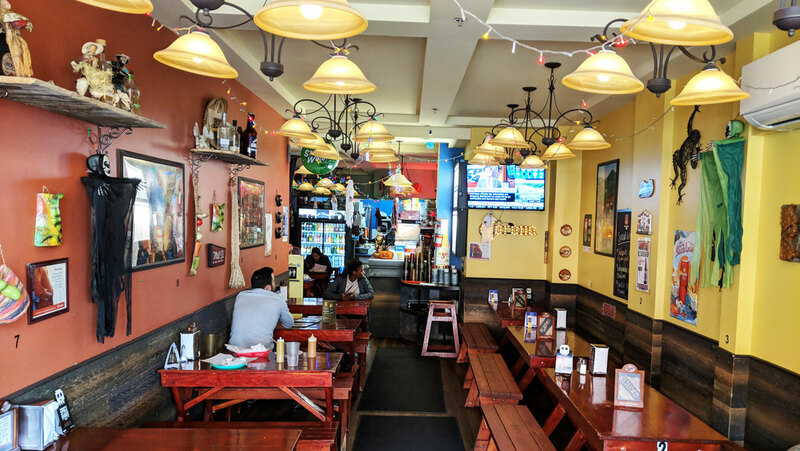 Michael’s is a tiny little take-out joint (they have a few stools, but most people get their food to go) with just a handful of things on the menu: oxtail, curried goat, and chicken (which you can get stewed, curried, or jerk). Everything comes with a generous serving of rice and peas, and a side of coleslaw. I got the oxtail, and it was an absolute taste bonanza. The oxtail itself was fall-off-the-bone tender, and the curry sauce was meaty and spicy, with a wonderfully complex flavour that never gets old; it’s one of those meals where finishing it makes you profoundly sad. And the zingy coleslaw does a great job of cutting the richness of the sauce. It’s absolutely perfect. It’s a great deal, too. I ordered the small, which is loaded with a very hefty amount of delicious food for an even ten bucks. I challenge you to find another meal in the city with a better price-to-deliciousness ratio. It’s impossible. It can’t be done. 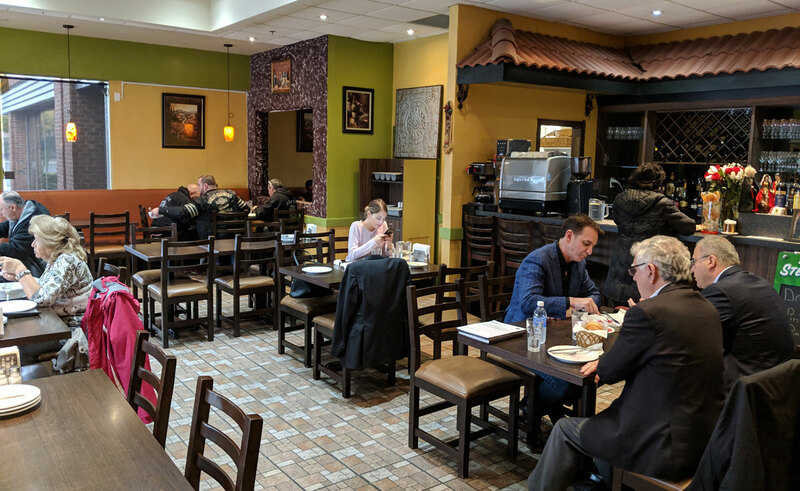 My one sentence summary of Tacos El Asador: tasty, but bland. I tried a couple of things, and they were both good, but neither really jumped out at me. Which is fine. Not everything can be a taste bonanza. Some things are just good. It’s probably at least partially my fault. 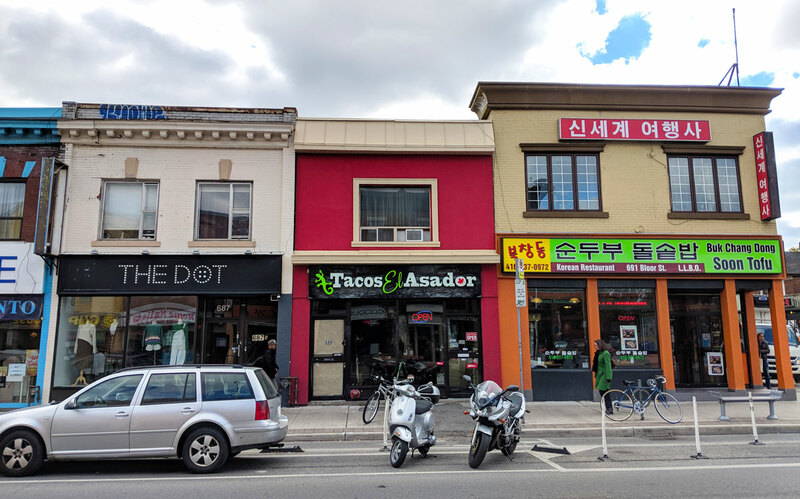 “Tacos” is right there in the name of the restaurant. I did not order a taco. 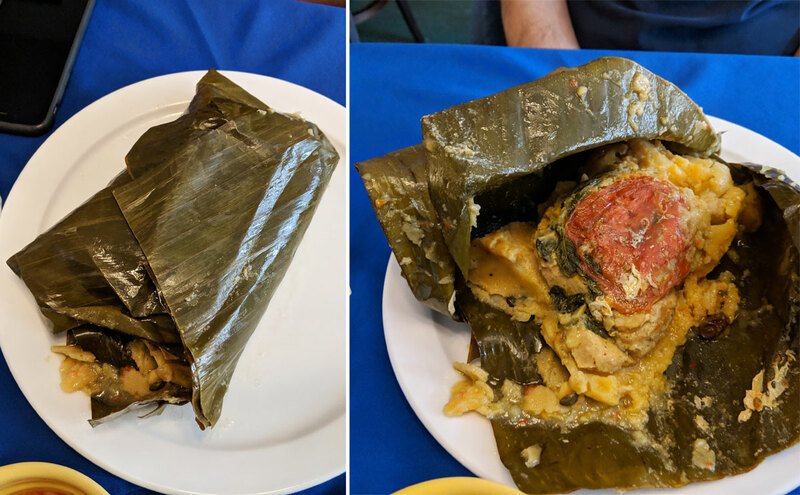 I wanted to stick to El Salvadorian specialties, so I ordered a tamale and a papusa. My dining companion, on the other hand, ordered a couple of tacos and thoroughly enjoyed his meal, so I think that’s the thing to get. 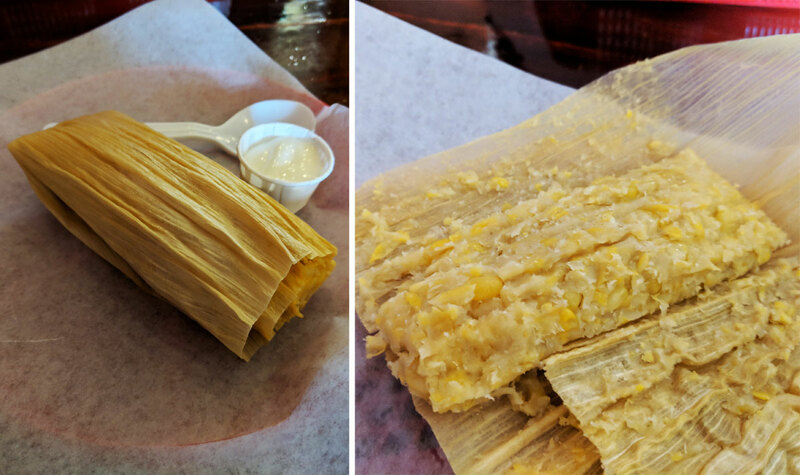 I started with a corn tamale (well, technically I ordered a chicken tamale, but they brought me a corn tamale. Things have to be pretty dire for me to complain at a restaurant, so I just ate what was in front of me). It’s a good quality tamale, though flavour-wise there wasn’t much going on. It was basically just plain corn meal with pops of sweetness from the whole kernels of corn. The two hot sauces on the table helped to bring it some flavour, as did the little cup of sour cream that comes on the side. 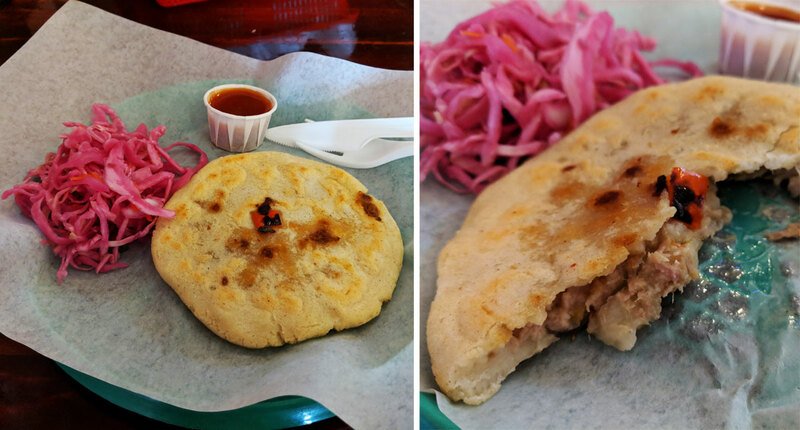 I also tried the pork chicharron papusa, which was kind of like an arepa, but with meat baked right in. And again, it didn’t exactly explode with flavour, but the pork was nice and tender and the exterior was satisfyingly crispy. It also came with a little cup of hot sauce that suited it quite well. 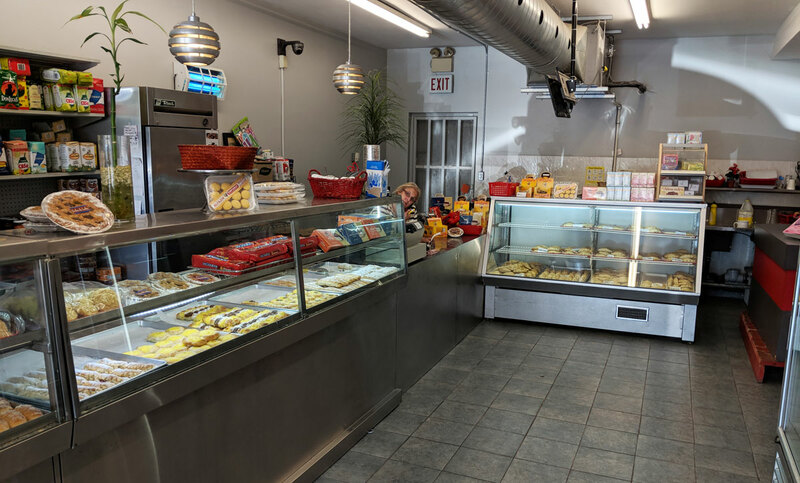 Emporio De Los Sandwiches is a delightful little bakery right around the corner from Yorkdale Mall that specializes in empanadas and seriously tasty-looking sweet pastries. I went in intending to only get a couple of empanadas, but the desserts were transfixing. I had a hard time narrowing it down to just a couple; they all looked so good. Don’t ask me what those desserts are, however; nothing was labeled. I asked the woman behind the counter what they were called — she told me and they were extremely Latin sounding. I felt bad asking her to repeat herself or write it down, so that was that. I’m not exactly Suresh Doss, in case you haven’t figured that out yet. I know what the empanadas are, at least! So I’m not completely useless. One was beef, and the other was chorizo (even my feeble brain can recall words such as “beef” and “chorizo”). They were both good, though the beef was clearly the better of the two. 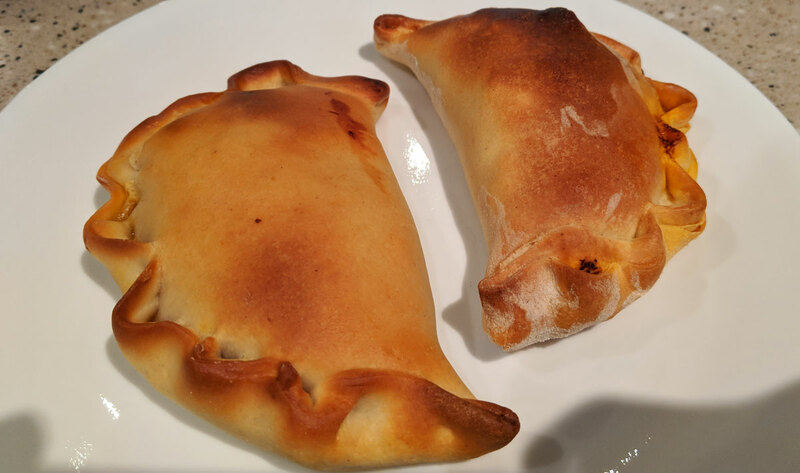 The chorizo was a bit dry and underseasoned; it was fine, especially since the quality of the pastry itself was quite good, but it was pretty average. 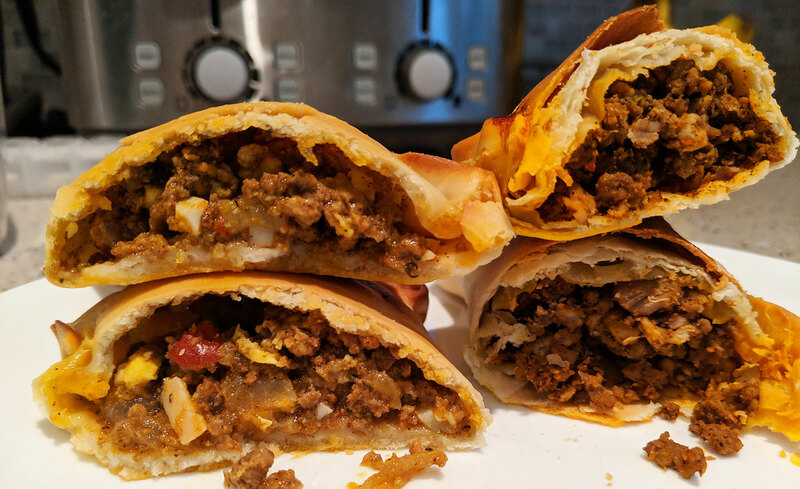 The beef, on the other hand, had an assertive flavour and a satisfyingly saucy consistency, featuring chunks of eggs and veggies to spice things up (metaphorically — neither empanada was spicy at all). The desserts were the same story: one great, one not so much. 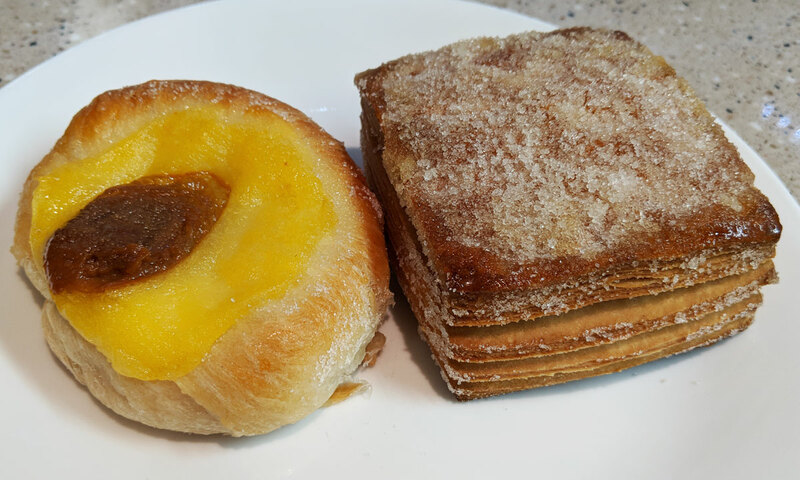 The round one was seriously delicious; the pastry was fluffy and doughnut-like, and the creamy custard and sweet dulce de leche went perfectly together. The square one was odd. 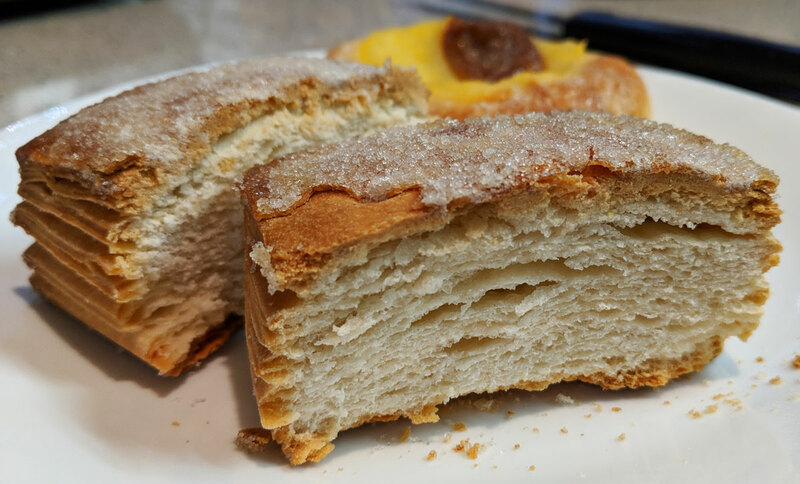 It basically tasted like a ridiculously fat square of dry, plain pie crust. It was hard and crunchy and barely sweet at all (I think the sugar on top was the only source of sweetness). It kinda went over my head. I don’t get the appeal. I’m pretty sure the woman behind the counter mentioned a caramel filling, so I’m going to assume that something was missing. 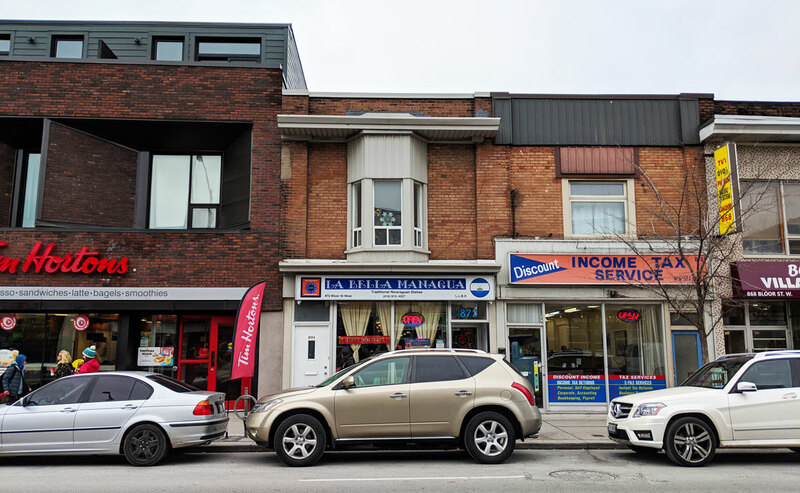 No, technically Chubby’s doesn’t qualify as a restaurant from Antigua and Barbuda. It’s Jamaican. It’s right there in the name. But there are a bunch of tiny Caribbean countries, and for the purposes of this blog, compromises are going to have to be made. Jamaican cuisine is probably going to stand in for pretty much every country in that area, because Jamaican restaurants are everywhere. The rest of the Caribbean? Not so much. Chubby’s is a bit of an odd one. 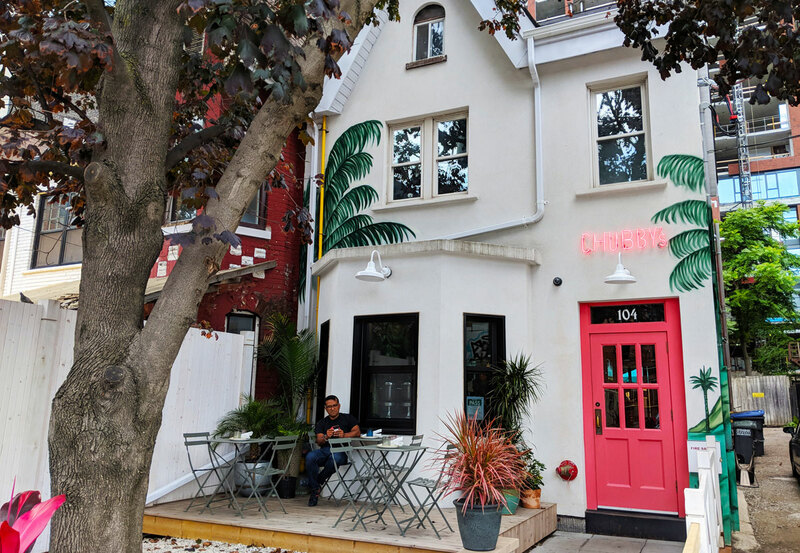 It’s a far cry from the typical hole-in-the-wall Jamaican place you’re expecting, with a twee, hipster-friendly dining room that looks like it’s been scientifically engineered for social media appeal (and indeed, if you look up the restaurant on Instagram, there are far more twenty-somethings taking selfies than pictures of the food). I was worried that the food might be an afterthought, but I tried a couple of things and they were both great. 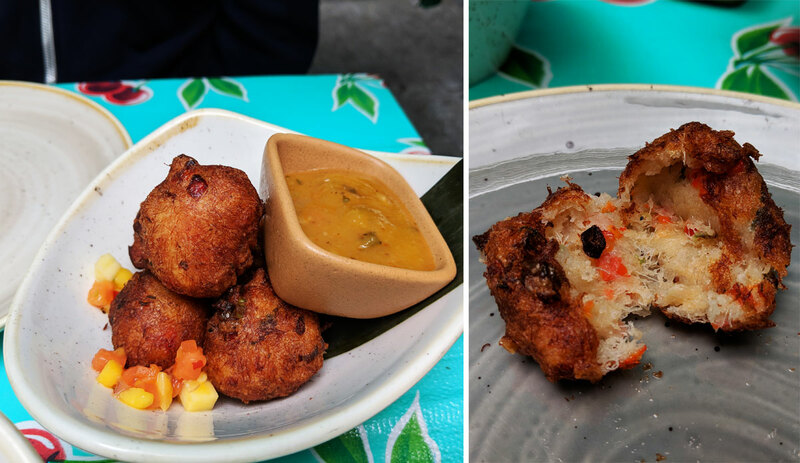 First up: the saltfish fritters, which are lightly crispy on the outside, with a chewy texture that’s reminiscent of glutinous rice. True to its name it’s both salty and fishy, but not excessively so; it’s nicely balanced. The strong flavours are complimented well by the mango-lime-papaya salsa, which is sweet and surprisingly spicy. 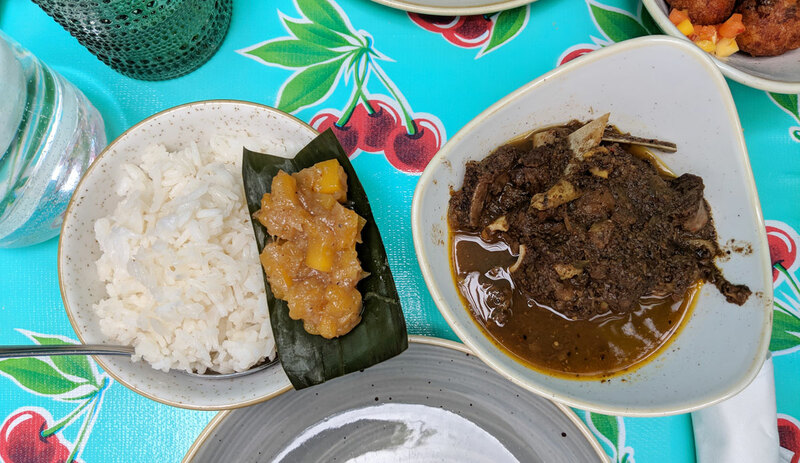 I also tried the curry goat, which features a generous amount of fall-off-the-bone tender meat in a fragrant curry sauce. It comes with a side of rice and a small helping of sugary-sweet mango chutney. The chutney seems way too sweet at first, but it kind of has the same appeal as eating cranberry sauce with turkey. It grew on me.